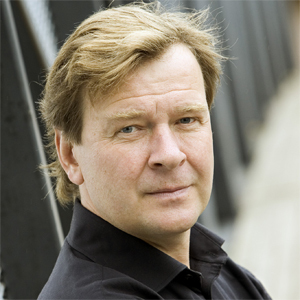 Magnus Lindberg is one of the internationally best known Finnish composers of today. He is predominantly a composer of instrumental music, above all orchestral music. His musical language is usually highly complex yet highly full of vim and verve. Lindberg is both rationalist and pragmatist, a hands-on musician - a pianist - who participated in many premieres in the early stages of his career and founded the experimental Toimii Ensemble. Lindberg studied composition at the Sibelius Academy with Einojuhani Rautavaara and Paavo Heininen (graduated 1981). The latter encouraged his pupils to look beyond the prevailing Finnish conservative and nationalist aesthetics, and to explore the works of the European avant-garde. This led around 1980 to the founding of the informal grouping known as the 'Ears Open Society' including Lindberg and his contemporaries Hämeeniemi, Kaipainen, Saariaho and Salonen, which aimed to encourage a greater awareness of mainstream modernism. Lindberg made a decisive move in 1981, travelling to Paris for studies with Gérard Grisey, the developer of spectral music, and Vinko Globokar, whose interests lay in the social functions of performing and in improvisation in contemporary music. The IRCAM and the impressive figure of Pierre Boulez contributed significantly to Lindberg's mental landscape. During this time he also attended Donatoni's classes in Siena, and made contact with Ferneyhough, Lachenmann and Höller. and later in composition masterclasses with Franco Donatoni, Helmut Lachenmann and Brian Ferneyhough.